From its beginnings as a farming celebration marking the end of winter to its current role as a global party featuring good food, lots of gifts and public parades, Chinese New Year is a snapshot of Chinese culture. Award-winning author and broadcaster Jen Sookfong Lee recalls her childhood in Vancouver, British Columbia, and weaves family stories into the history, traditions and evolution of Chinese New Year. 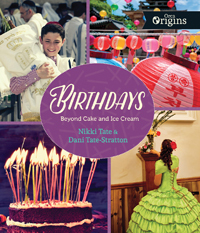 Lavishly illustrated with color photographs throughout. "[Readers] will find bright photos on every page, engaging personal stories, and informative sidebars." 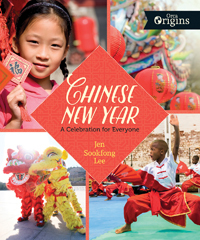 "Jen Sookfong Lee's Chinese New Year: A Celebration for Everyone comes together as a semi-autobiographical book blending history, family traditions and recipes. Informative accounts of China's political and cultural past are intermixed with stories of the immigration experiences from different family members. Lee not only shares how family traditions were passed on to her but then passes on these same traditions to readers through recipes and childhood memories. The glossy photographs portraying cultural celebrations worldwide act as a colourful and vivid backdrop for the books message which is Chinese New Year is a celebration for everyone." "Chinese and non-Chinese individuals reminisce about how they celebrated the holiday growing up. Their uniquely personal stories make this book stand out…Kids who think they know about this holiday will be surprised at the new things they learn." "Chinese New Year: A Celebration for Everyone provides a satisfying, well-rounded account of Chinese New Year…Readers will be attracted to the book as it offers a good balance between factual information about Chinese people's history and more experiential descriptions about Chinese culture and communal life…The book's numerous photos complement and enhance the text by providing a good visual reference which will be particularly useful for readers who have never visited China or who are unfamiliar with Chinese cultural traditions and history…A good resource for a social studies unit about Chinese or Asian culture…As a whole, Sookfong Lee's book is a welcome nonfiction addition to children's literature. Highly Recommended." "With cozy memories of her own childhood celebrations, Chinese-Canadian Lee successfully sets the tone—the text provides information, but it also acknowledges the very personal aspects of holidays and traditions…Lee capably conveys the diverse, dynamic nature of this holiday, from past to present to future. A thoughtful, thorough reference." "This wide-ranging, informative book describes the multi-faceted roots, history and evolution of Chinese New Year. Jen Sookfong Lee weaves together engaging personal anecdotes about family and food with fascinating facts about Chinese customs, traditions, and history, providing a window into a special event that over 20 percent of the world's population celebrates annually in 119 countries all over the world. Readers will enjoy the stories and photographs as much as the delicious recipes! Here's a book for the whole family to savour!" "I highly recommend this very personal, yet informative book full of the enchanting stories and diverse peoples of Chines New Year. A treasure for all generations, around the globe!" See the full list of Orca Origins.